I have never read any of her publications about her work, if they exist. (Perhaps this happens all too often in our closest, most intimate friendships?) From what I understand of the model she offers in other countries includes grassroots training of individuals and groups to form these concentric circles of compassionate support. They learn to surround, not only those who were direct victims and witnesses of gross human right violations and violent acts of blind-hatred against children, women and men, but also those who heard those stories at varying degrees of distance, with healing layers of real listening. For it is not only those who have directly experienced rational cruelty but also those who at-risk of vicarious trauma, compassion fatigue or secondary post-traumatic disorders who could be supported and protected in these ever-widening ripples. Adrienne has continued to offer her services to First Nations (and Inuit ?) communities in Canada but as yet there has been no response. 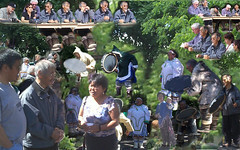 Perhaps there is a reluctance or a repugnance to compare the youth suicide epidemic, human rights abuses regarding access to education, housing, employment and health services (legacies of muddled administrative meddling, intergenerational mistakes on the part of those one-sidedly handed power over Canadian aboriginal affairs (for example the ongoing CAS child-sweep-ops), systemic and conversational racism, that have caused intergenerational loss of parenting skills, endemic poverty, violence against women, child abuse, and the social challenges that accompany such conditions, as comparable to tragedies in far-off less democratic countries. Perhaps when Rwandans (for example) and Canadian First Nations take part in open, frank, public, robust conversations about healing from trauma, we will all become more compassionate and more effective in dealing with these home-grown sources of shame and embarrassment. In her email Adrienne Carter reflected on a book she’ s been reading that very deeply touches her heart. It is called An Imperfect Offering: Humanitarian Action in the Twenty First Century by Dr. James Orbinski. Dr. James Orbinski is one of the founders of Médecins Sans Frontières (MSF), an international humanitarian aid organization that provides emergency medical assistance to populations in danger in more than 70 countries that has been honoured with the Nobel Peace prize. Dr. James Orbinski described his own role in the midst of the the most horrendous suffering of people including the famine in Somalia and the genocide in Rwanda and how it changed him as a person as he reflected. Adrienne is one of the few people to which I have entrusted my ongoing dilemma of being unable to rise above the life-shattering Carleton U-Nunavut experience (2002-2006). Her final sentence in that paragraph was: “I thought about you because you have also witnessed similar horrors up north and it also changed you as a person. ” Similar horrors up north in Canada in the 20th century . . . This is what makes it so hard to deal with . . . Mothers and grandmothers . . . they’re often the ones left holding the child. And the children and grandchildren in their own way give the mothers and grandmothers strength. And the strong ones like Adrienne Carter and Dr. James Orbinski are with them witnessing, sharing, walking with them and listening, really listening in concentric circles of caring . . .
For late 20th century profound insights into genocide see Zygmut Bauman. See also Hannah Arendt (1963) Eichmann in Jerusalem (1963). A respected elder and an Inuit filmmaker are two of the winners of this year’s national aboriginal achievement awards. Mariano Aupilardjuk of Rankin Inlet and Zacharias Kunuk of Igloolik are among a group of 14 notable people who will be honoured at a gala evening in Edmonton next month. Aupilardjuk, widely recognized throughout Nunavut for his wisdom and teachings of Inuit traditional knowledge, said he was proud of the award. “It made me accept myself more,” Aupilardjuk said through an interpreter. Aupilardjuk, who is now in his seventies, has spent years promoting Inuit culture. He’s given numerous talks at Nunavut schools, as well as throughout Canada, on Inuit traditional knowledge. He has a deep sense of how Inuit Quajimajatuqangit links the past, present and future of the Inuit people. Aupilardjuk said many Inuit are taking a keen interest in preserving their age-old traditions by incorporating them into everyday life. “I am happy about it. I’m hearing it more from others about how important it is and how it’s becoming a reality,” Aupilardjuk said. The National Aboriginal Achievement Foundation is also praising the elder for his work with healing circles throughout the territory. Aupilardjuk’s sense of spirituality and compassion was evident last week when he sang a powerful song at an Inuit Quajimajatuqangit meeting in Iqaluit. The song told the story of a homeless man Aupilarduk saw on the street in New York City. He said people walked past the man, showing little compassion for his suffering. During the song, the elder touched his heart and the words brought many people, including Aupilardjuk, to tears (Rideout 2001a). Mariano Aupilardjuk of Rankin Inlet Aupilardjuk, widely recognized throughout Nunavut for his wisdom and teachings of Inuit traditional knowledge, said he was proud of the award. “It made me accept myself more,” Aupilardjuk said through an interpreter. Aupilardjuk, who is now in his seventies, has spent years promoting Inuit culture. He’s given numerous talks at Nunavut schools, as well as throughout Canada, on Inuit traditional knowledge. He has a deep sense of how Inuit Quajimajatuqangit links the past, present and future of the Inuit people. Aupilardjuk said many Inuit are taking a keen interest in preserving their age-old traditions by incorporating them into everyday life. “I am happy about it. I’m hearing it more from others about how important it is and how it’s becoming a reality,” Aupilardjuk said.The National Aboriginal Achievement Foundation is also praising the elder for his work with healing circles throughout the territory. Aupilardjuk’s sense of spirituality and compassion was evident last week when he sang a powerful song at an Inuit Quajimajatuqangit meeting in Iqaluit. The song told the story of a homeless man Aupilarduk saw on the street in New York City. He said people walked past the man, showing little compassion for his suffering. During the song, the elder touched his heart and the words brought many people, including Aupilardjuk, to tears. [2004 Aupilardjuk is 81. He grew up near Nattiligaarjuk, Committee Bay where there was lots of ‘old ice’ and therefore Qallupilluq (Ernerk 1996)] Nunavut’s commissioner, Peter Irniq, said both men are well-deserving of their awards. Peter Irniq has a special respect for Aupilarduk, because their families lived together in an outpost camp near Repulse Bay when Irniq was a child (Rideout 2001a). Poll. 2004. “GN Government priorities.” in Nunatsiak News.